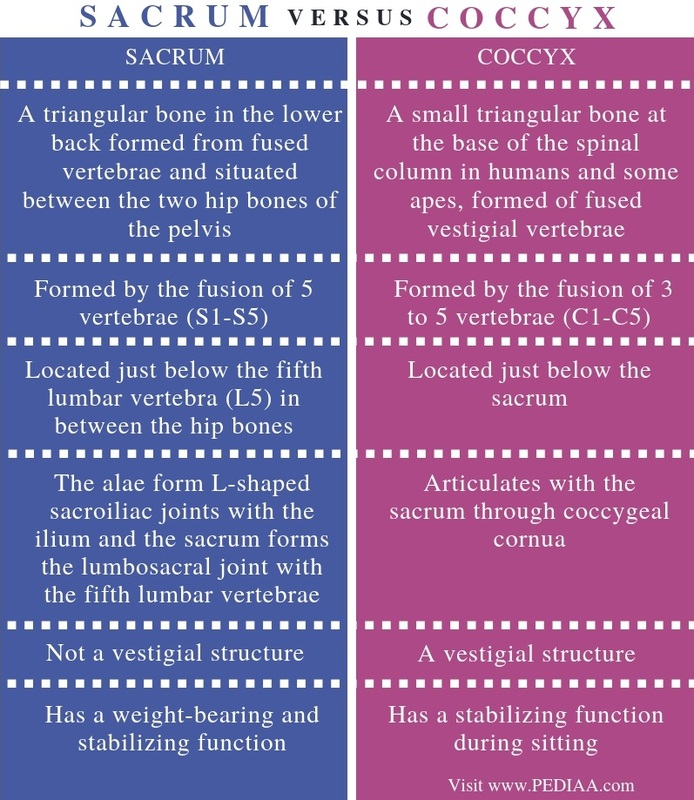 The main difference between sacrum and coccyx is that sacrum or the sacral spine is the large, flat, triangular-shaped bone located below the fifth lumbar vertebra (L5) and in between the hip bones whereas the coccyx or tailbone is located below the sacrum. Furthermore, the sacrum comprises 5 fused vertebrae while coccyx comprises 3-5 fused bones. Sacrum and coccyx are the two types of bone structures present at the bottom of the spinal column. Both types of bones are composed of smaller bones, which fuse together to form a solid bone mass by age 30. The sacrum is a wedge-shaped bone formed by the fusion of five sacral vertebrae (S1-S5). In childhood, individual sacral vertebrae can be identified in the spinal column, separated by intervertebral disks. However, after age 20, they tend to fuse together through the ossification of disks, forming a single bone. Significantly, females have a wider sacrum while the first sacral vertebra is larger in men. Furthermore, the sacrum forms the upper back part of the pelvic cavity. It articulates with the ilium via two projections at each side of the sacrum known as alae (wings) by forming the L-shaped sacroiliac joints. Also, the sacrum articulates with the fifth lumbar vertebra via the lumbosacral joint. Moreover, the main function of the sacrum is to form the back of the pelvis, stabilize the bottom region of the spinal column, and bear weight. Coccyx or tail bone is a vestigial structure of the human skeleton. It is the remnant of the embryonic-tail-like protrusion. Later, it became a small, triangular bone formed by the fusion of 3 to 5 coccygeal vertebrae. Significantly, these vertebrae are not well developed when compared to the other vertebrae in the spinal column. However, coccyx forms the final segment of the spinal column. It only articulates with the sacrum from the top by forming the sacrococcygeal joint. 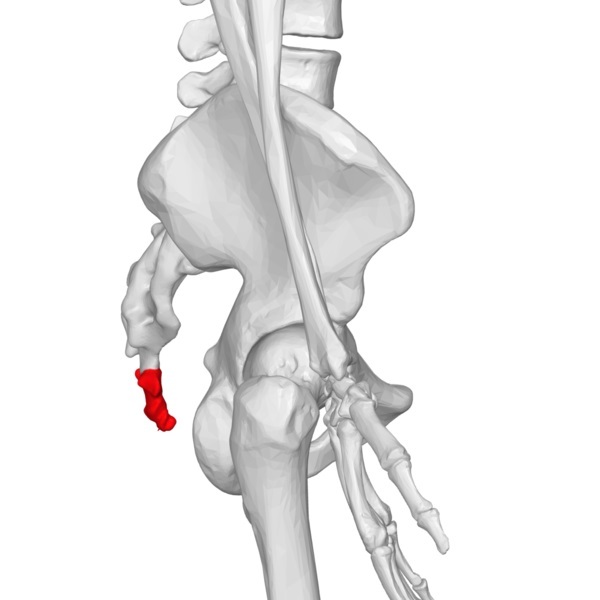 Moreover, coccyx does not play a unique function in the skeleton. However, it moves slightly during the movement of the legs. In addition, coccyx is one of the three parts involved in sitting. That means; the two bottom parts of the hip bones and the coccyx are responsible for providing balance and stability while sitting. Sacrum and coccyx are two types of bone structures located at the bottom of the vertebral column below the fifth lumbar vertebra (L5). Generally, both bones are made up of smaller bones. These smaller bones are fused together to form a solid bone mass by age 30. They are components of the pelvis and have a triangular shape. Moreover, they form the sacral curve of the spinal column. Besides, both types of bones playa function during sitting, standing, and walking. Also, they are responsible for weight-bearing. Both may be involved in low back pain. Sacrum refers to a triangular bone in the lower back formed from fused vertebrae and situated between the two hip bones of the pelvis while coccyx refers to a small triangular bone at the base of the spinal column in humans and some apes, formed of fused vestigial vertebrae. Thus, this is the main difference between sacrum and coccyx. Furthermore, the sacrum is formed by the fusion of 5 vertebrae (S1-S5) while the coccyx is formed by the fusion of 3 to 5 vertebrae (C1-C5). Hence, this is another difference between sacrum and coccyx. Moreover, their location is also an important difference between sacrum and coccyx. While sacrum is located just below the fifth lumbar vertebra (L5) in between the hip bones, coccyx is located just below the sacrum. The alae of sacrum form L-shaped sacroiliac joints with the ilium and the sacrum forms the lumbosacral joint with the fifth lumbar vertebrae while coccyx articulates with the sacrum through coccygeal cornua. Also, one other difference between sacrum and coccyx is that sacrum is not a vestigial structure while coccyx is a vestigial structure. Besides, sacrum has a weight-bearing and stabilizing function while coccyx has a stabilizing function during sitting. So, this is also a difference between sacrum and coccyx. The sacrum is a mass of bones located just below the fifth lumbar vertebra. Also, it articulates with the ilium to form the pelvis. Therefore, it has a weight-bearing and stabilizing function at the bottom of the spine. In contrast, coccyx or the tail bone is the final part of the spinal column. It is considered as a vestigial structure as it has no prominent function in the skeleton. However, it helps to stabilize the body while sitting. Both sacrum and coccyx are two bones occur at the bottom of the spinal column. However, the main difference between sacrum and coccyx is their structure and role. 1. Eidelson, Stewart G. “The Sacrum and Coccyx.” SpineUniverse, Available Here.